It’s the time for announcing the winners, asianet and asianet hd will air Bigg Boss Finale this sunday at 7.00 P.M Onward’s. Malayalee television viewers are eagerly waiting for the final moments of malayalam bigg boss. season 1 of the show will be complete this week and we can wait for it’s next edition. 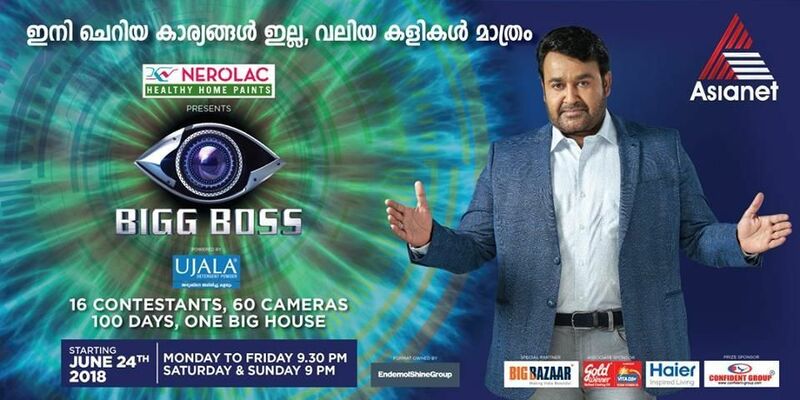 Asianet introduced malayalam version of bigg brother reality show with Mohanlal as host. Star network holding the telecast rights of bigg boss in Telugu, tamil and Malayalam. Star Maa, Star Vijay are the other channels airing this show in Telugu and tamil. This week is very special for kerala television viewers, 2018 ISL is kick starts on 29th September. Asianet movies ready to air all indian super league 2018/19 matches with malayalam commentary. Next attractions is the finals of malayalam bigg boss. Asianet schedule for sunday is start with Anatham Ajnatham, it’s airing at 6.30 P.M. Sponsored Program Soorya Festival 2017 is coming after this at 7.00 P.M. malayalam agriculture show Kissan Krishideepam airing at 7.30 A.M on Asianet. Auto Graph- The Motor Show, Cinema Diary, Vandhyatha Oru Shapamalla etc are the other programs at morning slot. What is your opinion about the show, who will win the title ?, do you have any predictions. you can support any of these contestants by searching ” Bigg Boss Malayalam Voting ” and vote to the contestant. you can vote upto 50 votes per day using google voting system.